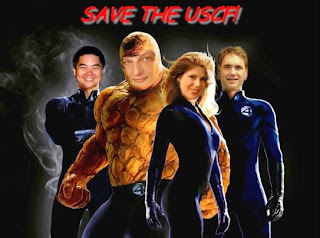 Susan Polgar and Paul Truong have just been expelled from the US Chess Federation. The Executive Board started the process last month; a final hearing was held last night; and the Delegates rejected the final appeal this afternoon. Susan and Paul appeared with their lawyer shortly after 2 p.m. Eastern Time. The meeting lasted until after 6:30. Bill Hall, the USCF Executive Director has banned any discussion of the meeting from the USCF's Forums. This does not prevent this blog or any other independent news organization from reporting the news about events they deem the public has a right to know. from Susan Polgar's Blog. Artwork used with permission. This picture was from the 2007 campaign and happier days. Of the three, Mikhail Korenman lost; the others all won. Randy Bauer became Chairman of the Litigation Committee and voted to expel Susan and Paul. Are you sure they've been expelled from the federation or just from the executive board? I read the article on on the USCF site pretty quickly, but it seemed ambiguous. She and Paul were expelled from the USCF - entirely. This means that not only are they not officers, but they are not even members anymore.